Yeah, it sounds nuts. What the heck am I talking about? When I learned a long time ago that neuron connections are vital for a rich, healthy brain, it became my focus. I wanted to make sure that when I took information, I was building new connections and hopefully improving my ability to retain what I was learning. Ever since I walk around trying to take in new information and relate it to existing information hoping to connect and cement that new knowledge into my internal database. It seems to have worked for me and became my top priority for raising my kid. Build her neuron connections. I have been less interested in what she learns than how she’s learning it. Whenever there’s been an opportunity to stop the conversation and relate the content to other things, I’ve done it. That “pause” button on our TiVo remote is the most-used button the dang thing. No show goes unpaused. We are always stopping to analyze, debate, question, relate and even fact-check the information that’s coming our way. And last night, I got to see some of the fruits of my labors! 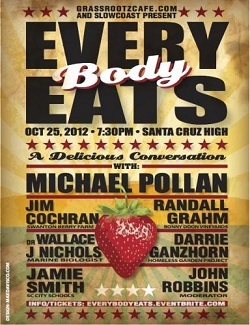 We attended Every Body Eats with a panel of guests and food expert, Michael Pollan. The venue was packed and warm and based on discussion; not the kind of event a 13 year old puts high on her list. I had no idea how the night was going for her while we were there but boy did I find out when I got home! Katie blasted in the house at 9pm saying she needed to finish watching a video she has started on nutrition that is part of her science fair project. Okay, I said, go ahead. The next thing I knew she was asking me about details of the talk – Monsanto, DuPont, more about corn and GMO corn, nutrients – and I just kind of watched it unfold. “Mom, tonight was totally about my project!” she exclaimed about 20 minutes later. She was suddenly synthesizing information in new ways and I was watching her connect information from different sources and getting how they related or conflicted with what she was thinking. I didn’t realize it but she was putting together the information that supported her hypothesis for the Science Fair and she was so excited. I have loved watching her grow over the years. Not just the obvious ways but how reading and math provided the foundation for learning more complex concepts. How she has been able to move from me helping her with home work to finding help online and with her peers. And now how she is taking responsibility for learning what she will not be taught in any formal way. That kind of learning many of us still pursue when something grabs our interest. Her new holy grail: contributing to the body of knowledge. We’ll see how that goes. In the meantime, this is so fun. She’s helping me build new neuron connections! It’s Grassroots Baby – One Otter at a Time! Join the campaign!